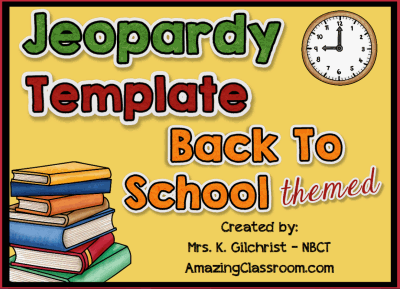 This Back to School themed Jeopardy Template is perfect fun for any grade level and subject. All of the hard work is done for you, just type in your category titles, your questions, and answers and you are ready to go. Scoreboards are provided on the game board page, just click the up arrow to increase a team's score by 100 and the down arrow to decrease their score by 100. Now you can create Jeopardy games with ease. Fun for all ages! Enjoy!